As the Spice Girls proclaim, spicing up your food can definitely spice up your life and offer joy both emotionally and physiologically. Whether you choose the bitterness of garlic, the sweetness of cinnamon or the umami and heat of a kimchi, you can ensure the time is filled with joy rather than pain. It's been said that variety is the spice of life. This is epitomized during the Holiday Season when an incredible array of flavours tantalizes and tempts us. The myriad of different foods from all over the world is both intriguing and depending on portion size, intoxicating. For those with willing taste buds, this time of year allows for experimentation and remembrance of gastronomical moments to keep in mind for future celebrations. One of the easiest ways to increase the intrigue of food is to add spices. Over the centuries, dozens of different delectable additions have increased the scope of our cooking potential and given us the ability to impress any visitor. 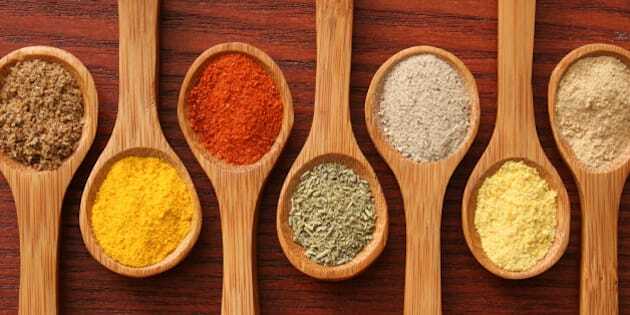 But while spices may offer a different twist to an ordinary dish, many also offer a benefit to our health. Thanks to research, we can use spices to help keep our bodies safe from infectious disease and ensure the memories from a meal are positive rather than porcelain. When it comes to killing microbes, perhaps none is better than the spice known as capsaicin. This chemical is the main component of chili peppers and has been used for centuries in many different cultures. For those willing to feel the burn and keep out the pathogens, this addition to any meal is a must. For those who are not particularly keen on having a hot mouth, there are other less painful options. One of the most popular additions to any dip or sauce is raw garlic. The main component of the taste of this bulbous plant is called allicin. Not only does it offer flavour, studies have shown it can inhibit and kill a number of pathogens. Though the effect on our breath may not be conducive to a kiss or close conversation, the overall benefit to our health is well worth the social distancing. In the same vein as garlic, raw onions and ginger are also good for the body. Not only do they offer antimicrobial activity but they also have antioxidant properties to keep the inflammation down. When added with honey, ginger provides even greater positives giving a double hit of incredible taste and pathogen killing. Of course, the heat and stink factors may keep them off the recipe list for Holiday Season. But there are other wonderful options. Back in 1998 a team of scientists looked at 21 spices to determine if there were any that stood out from the others. Not surprisingly, almost all of them showed the ability to prevent the growth of pathogens. This led researchers to focus on specific ones to better understand their function. In 2009, fennel seeds were put to the test. This licorice-tasting addition was shown to stop a number of bacteria, including some gut pathogens. The data was similar to previous studies focusing on the effects of the similarly flavoured anise. By adding either seeds or dust from these two plants, not only will the taste buds be happy, so will the gut. In 2011, the effects of cinnamon, clove and cumin were tested against one of our most dangerous pathogens, MRSA. The results showed all were able to prevent the bacterium from growing and even killed them at higher concentrations. In terms of usage, by keeping the food spicy, the body, not just the tongue, would benefit. In 2013, it was nutmeg's turn. The wonderful component is in almost every Holiday treat, from egg nog to Christmas cake. Back in 1998, it had shown it could stop the foodborne pathogen Listeria monocytogenes. This study increased its reach preventing bacterial and fungal spoilage. There is one final way to bring flavour and health together for the Holiday Season: fermentation. Although many a fermented drink may be consumed, adding in some food to the mix can bring delight to everyone. The reason stems from the fifth taste bud, umami. Research has shown this component of our gastronomical senses - best described as savory - is due in part to our penchant for taking in acids caused from fermentation. Although umami chemicals can be found in non-fermented foods, almost every microbe-rich offering will offer this amazing taste. Of course, the added benefit is the inclusion of a number of good germs to the mix to help keep the body healthy. As the Spice Girls proclaim, spicing up your food can definitely spice up your life and offer joy both emotionally and physiologically. Whether you choose the bitterness of garlic, the sweetness of cinnamon or the umami and heat of a kimchi, you can ensure the time is filled with joy rather than pain. Even better, as the calendar changes from 2014 to 2015, make the decision to keep these spices and fermented foods in your diet so that you can benefit the whole year round. May you all have a fantastic Holiday Season and a Happy New Year.